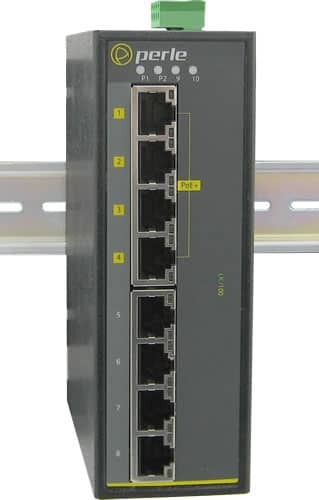 IDS-108FPP-S2ST20-XT - Industrial Ethernet Switch with Power Over Ethernet - 8 x 10/100Base-TX RJ45 ports, 4 of which support PoE/PoE+ and 1 x 100Base-LX, 1310nm single mode port with duplex ST connector [20 km/ 12.4 miles ]. -40 to 75C Industrial extended operating temperature. IDS-108FPP-S2ST20-XT Industrial PoE Switch. 8 x 10/100Base-TX RJ45 ports, 4 of which support PoE/PoE+ and 1 x 100Base-LX, 1310nm single mode port with duplex ST connector [20 km/ 12.4 miles]. -40 to 75C Industrial extended operating temperature. For complete product details and technical specifications, please visit our IDS-108FPP 8 port Industrial Ethernet Switch with Power over Ethernet Product Page.